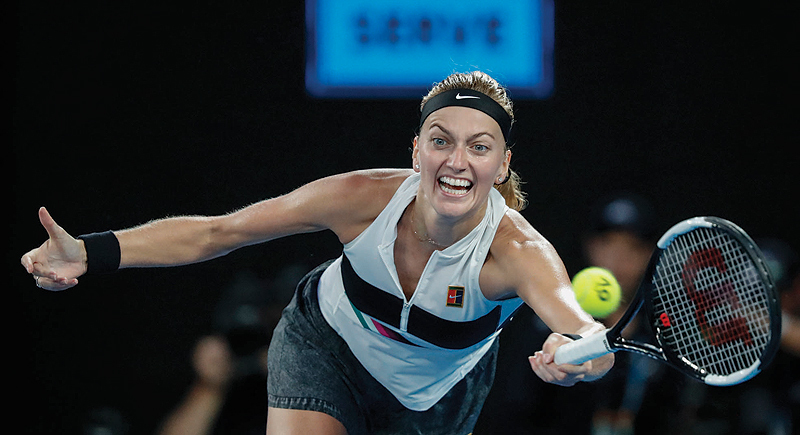 MELBOURNE: Rafael Nadal continued his relentless march towards an 18th major title yesterday as an emotional Petra Kvitova swept into her first Grand Slam semi-final since a terrifying knife attack almost ended her career. On day nine of the Australian Open, the fairytale runs of Stefanos Tsitsipas and Danielle Collins were also extended as they too swept into the last four. Second seed Nadal inched closer to winning an event he has only claimed once before when he trounced unseeded American Frances Tiafoe 6-3, 6-4, 6-2 in another ruthless display from a man who has not dropped a set so far. “I feel lucky to be where I am.” Greek sensation Tsitsipas powered into the last four with a measured 7-5, 4-6, 6-4, 7-6 (7/2) win over Spain’s Roberto Bautista Agut. The 20-year-old, who ended Swiss great Roger Federer’s tournament, became the youngest man to reach the semis at Melbourne Park since Andy Roddick in 2003 and the first player from Greece-man or woman-to get so far at Grand Slam. Kvitova will face unseeded American Collins in the semi-final tomorrow and she desperately wants to reach Saturday’s decider. “I want it bad, that’s right,” she said. Collins, the world number 35, had never won a Grand Slam match before entering this year’s tournament but she stunned three-time major champion and second seed Angelique Kerber in round four. And the 25-year-old from Florida continued her Cinderella run by bouncing back spectacularly to down Russia’s Anastasia Pavlyuchenkova 2-6, 7-5, 6-1 in the quarter-finals. Collins, who has spent long stretches of her career playing small tournaments to build up her ranking points, was in big trouble after losing the first set to the world number 44.